1. Put the eggs into a saucepan large enough to accommodate them comfortably in a single layer. Cover with cold water. Place over a high heat, bring to the boil then simmer for exactly 6 minutes. Remove from the heat and cool under cold water. 2. When cool enough to handle, carefully peel away just enough shell at the pointed end to remove the contents with a teaspoon. Draw a funny face on each shell. 3. Place the egg into a bowl with the mayonnaise, radishes and chopped chives. Season and mash well with a fork. 4. Spoon the egg mixture back into the shells. 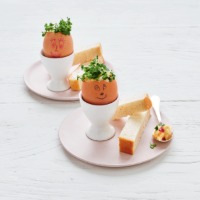 Place into egg cups and then add cress, chives, or sprouts as hair. Serve with buttered bread and the extra egg mixture on the side. Egg recipes containing raw or semi-cooked egg are not suitable for pregnant women, elderly people or those with weak immune systems.